The boat was running out of fuel. We were stranded, far away from the safety of our home. But the goal was more important; we needed to know everything we could about these lands. A sudden crawling sound stopped the eerie calm of the sea (or “zee,” as the locals call it). When we turned out the lights, revealing our presence in the process, islands infested by spiders were introduced upon our eyes. We used what was left in our tank fuel to escape from that place, but the sacrifice was high. In order to create fuel, we had to use our few remaining resources. And when starvation arose, some crew members started to disappear. No one spoke about this ever again. But the “zee” remembers. One can become anything in Sunless Sea, but that decision will forever remain throughout the vast and mysterious “zee.” My first character was a poet who went out to explore with only one goal in mind: to collect as many stories as possible. This ambition gave purpose to his personal story, but one quickly finds out there’s a lot more going on in every ship, island, and civilization we meet in our travels. There’s also a mix of rogue-lite elements, encouraging players with messages saying that their characters will undeniably perish, but the legacy will remain echoing in future playthroughs. The map, while huge, is only discovered by exploring it, which is a task that is always rewarding you with experience points, called Fragments. Gather enough of these and you’ll unlock a Secret, which can be used to upgrade your crew stats. You can also obtain new ships and equipment for them, purchase resources such as fuel and food (both key if you want to survive long enough out there) or even hire more crew members, which carry a certain ability to better suit different roles in your ship. Again, there’s a lot to take in, but Sunless Sea is wary of this. Lore is embedded in every corner of Sunless Sea, playing a major role in how the game communicates with us. Part of the overwhelming sensation of the first few hours into the experience is due to this, but the world does a perfect job of showing you everything at a steady pace. Collecting stories isn’t just fixed to the initial Ambition you choose for your character; they can be used for unlocking certain activities and dialogue options for every encounter. Each island carries a story, unique locations to visit and interact with, and, sometimes, big disputes in which you can take part of. In one of the poet’s travels, he provided help to a guinea pig civilization in Pigmote Isle, not without taking a side first. One wanted to reclaim what were rightfully theirs and return to the land they had left years ago, while the other had a different purpose, and a higher conflict in hands. We became victorious, but as in every decision I made, there were consequences to come for these actions. The studio did a stellar job in showcasing a whole new universe that is both complex and easy to incursion into it at the same time, and that’s thanks to the writing and Sunless Sea’s own glossary. While most of the game is based upon reading, adapting to this new style sparks curiosity in no time, and that’s what keeps you going over and over to discover more about the world. It’s easy to get lost in Sunless Sea’s seductive prose, unimaginable wonders, and forbidden knowledge about rituals and ancient gods, and there’s a Fear meter that reflects exactly this. If you dive enough through the zee, this will begin to increase periodically. Turning off the lights of your ship to make yourself unknown to lurking danger can be a great tool in some of the most risky moments, but fear will start increasing faster. And your crew’s sanity is additionally put to a test. There are random events that can happen in the zee, but by far, one of the most intriguing ones I’ve encountered is listening to a god’s statue only to see my character involved in a strange ritual in an unknown location. The further you get into Sunless Sea, the more you’ll discover how deep it really is. Additionally, the Zubmariner Edition includes even more content on top of the base game, including new locations to visit and creatures from which to escape from. 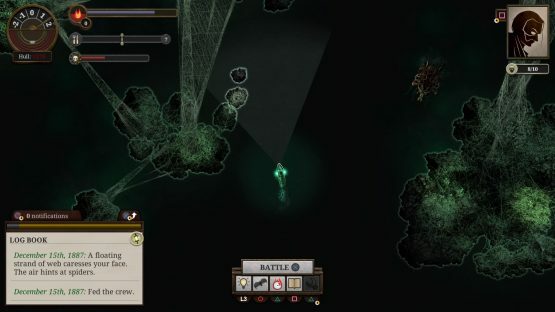 Although it was initially launched with the PC in mind, Sunless Sea translates perfectly to PS4, using button shortcuts to expand or close menus and leaning on the triggers for using weapons and abilities. Failbetter Games have brought upon themselves a trademark capable of enduring over time, born with Fallen London back in the day and now present in both Sunless Sea and the upcoming Sunless Skies. This is by far the best way to experience the studio’s vision and their unique take in narrative driven games. 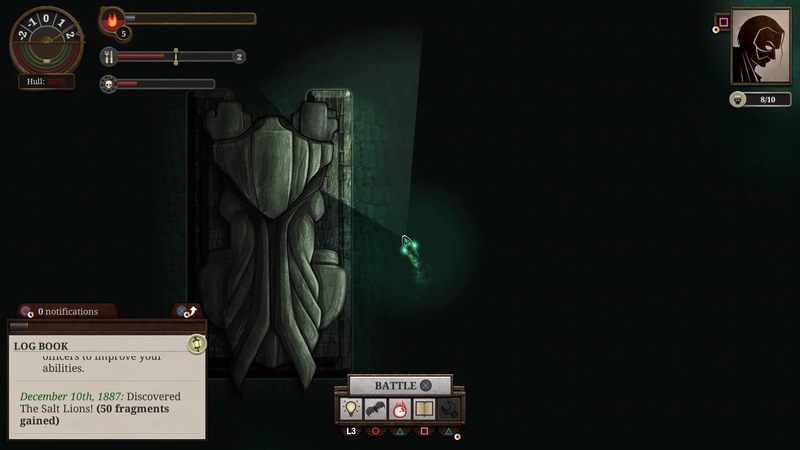 Sunless Sea: Zubmariner Edition review code provided by publisher. Version 1.0 reviewed on a standard PlayStation 4. For more information on scoring please see our Review Policy here.